I've realized recently that I go through cycles of liking to do things the easy way or the hard way. I almost quit music in secondary school (I wasn't particularly talented), but I ended up majoring in it at university because it was the most challenging thing that I could be doing at the time and I enjoyed the thought of turning a weakness into a strength. I eventually tired of the struggle so when I left music I chose law because I did well on the law school admission test, so I figured I was well suited for it. At that point in my life, I didn't want to bother with my weaknesses, only capitalize on my strengths. Since then I've alternated between focusing on either my weakness or strengths, maybe every few years or so. Most understand the appeal of the easy way, but doing things the hard way has its own value (and Thoreau?). The Swedes understand this. 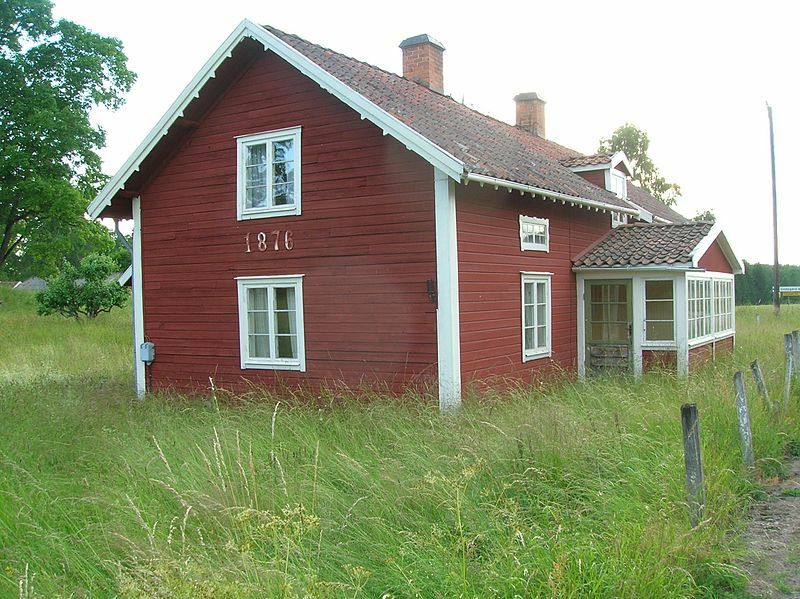 Although most Swedes have access to some sort of cottage or summer home, many of these homes intentionally do not have indoor plumbing, an attempt to be closer to nature. I spent some time there with a friend and she much preferred cooking up a porridge on the side of the road with a camp stove, or a soup on the deck of a ferry, to anything remotely more convenient. Even though my visit was on the tail end of summer in the chilly Arctic Circle, she insisted that part of the experience of any trip was to sleep outside whenever possible. We would go days without using a normal toilet, much less shower. I was sometimes tempted to put my foot down and insist that we take advantage of modern amenities and conveniences for a change, but I didn't. And even though I have been on much more comfortable and more exotic trips, this one has remained my favorite I think largely because it required struggle. It required me to be resourceful and more actively engaged in every moment of the trip, whereas waking up in crisp hotel sheets and stumbling down the hall to a buffet breakfast required no thought at all. The former meant living every minute and the latter invited passivity and complacency, it's own sort of (worse) struggle. Thanks. I really needed this right now. You have served your purpose. True happiness is doing something different things everyday. I guess psychopaths have the happier life. Why do you think psychopaths have the happier life? Neurotypicals like variety too. idk how anyone can say who is happier than the other. If a shrink categorizes people and sees all the empaths depressed and all the psychos happy, they will make generalizations. spend time with regular happy people and there will be variety. maybe the above poster spends too much time with angsty types. Amen. Although I'm an (extreme) empath and you're a sociopath, we have a lot in common. I think to do things the hard way when they can be done the easy way is nonsense. Why to reinvent the wheel when it has been already invented? Why not to invent rather something new? I don’t see the value neither of doing something just for the difficulty of it either. Why to pursue something difficult if it’s nothing we are passionate from when we can pursue to excel at something that we like? I conceive the two options to be done to satisfy an ill-mannered ego (especially the first one, the second one can have one exception: if someone likes nothing). In general, there are enough meaningful hard challenges for each person to pick from. I remember the film “Into the Wild”, based on the real story of a young guy, academically bright, who decided to life on his own in Alaska. He died less than four months later at the age of 24. An ill-mannered ego makes some smart people take too stupid choices even for the stupid. I know someone that does this to a tee. Even with 2 marriages. I pointed out to them that I saw the similarities of the 2 self-destructive cycles, but they didn't change. I know I make the same mistakes over and over, as well. Jessi demonstrates yet again the depth of her ignorance and stupidity. Oh, we go back to the "you wrong, you bad" with no argumentation. I do enjoy succeeding in situations that are far more stressful than they need to be. I think that comes mostly from my extreme propensity for procrastination, though. And even then, procrastination carries very little risk, because I'm confident I can do at least an acceptable job at any task given what should be very restrictive time constraints. "I think to do things the hard way when they can be done the easy way is nonsense. Why to reinvent the wheel when it has been already invented? Why not to invent rather something new? I don’t see the value neither of doing something just for the difficulty of it either. Why to pursue something difficult if it’s nothing we are passionate from when we can pursue to excel at something that we like?" For the most part, I actually agree with Jessi here. I'll build upon it by saying that although you may give up your creature comforts, they are never out of reach. You didn't take on any real risk, any new danger, you just made yourself uncomfortable for a little while. I understand the urge to break free of comfort. Being static is extremely boring, and as I get more and more bored I take greater and greater risks, until I find the catalyst that transmutes me into something new. My changes are not so extreme as the major changes in career focus that you experience. I change enough in my life that my day becomes new again, but I will not lose hold of my career. My career is my anchor, and I may lower a speedboat every once in a while to have some fun, but I can always come back and find that my ship holds fast and hasn't sailed off into the ocean, irretrievable. “Nothing so fatiguing as the eternal hanging on of an uncompleted task” said William James. Procrastination is something else. Is not that you postpone things on purpose to make them more challenging is that you don’t feel like doing them, therefore you postpone them, and at the end you are happy to know you had acceptable results. The real challenge for a procrastinator is to be as efficient at the beginning. Needing your career as an anchor it is not very sociopathic. I’m going to say something positive about you. Please sit :P One of the things I like of you is that you don’t excuse yourself in being the way you are as “this is how I am wired”. Agreed, tackling a task and completing it well in advance of when it is due would be a challenge for me. Motivation comes in the form of avoiding consequences, though, and thus far consequences have been insubstantial. One of the core psychopathic traits is making excuses, not accepting responsibility for one's mistakes. This comes very naturally to me, but I made a conscious effort to change it. Now I almost never make excuses. I accept responsibility for who I am and what I do, and that opens me to changing the flaws that hold me back from reaching my potential. Narcissism also feels very natural to me, but I have worked hard to suppress it, at least in person. In my work, I'm surrounded by highly intelligent people who are not fooled by my displays of self-love. They were more of a detriment to me than an asset, so I forced them beneath the surface. I work against my nature daily, and though it is difficult, I rarely slip. A crowed flat hierarchized scientific academic environment it is a good environment for someone with narcissist or sociopath trends if there is a willingness to improve. If there is not willingness to improve the person will move quickly out of that environment, usually towards a more political position, since he will enter a conflict with his high perception of self and meeting very intelligent people that are hard workers and will outperform in the results, which are objective in science, which makes too difficult for the narcissist to enter into his delusional mode. Yes, it was that kind of work environment that forced me to either change fields, or change myself. I decided to change myself. You're coming across as surprisingly insightful today. Are you feeling well? Are you playing a game with me? doing things the hard way creates drama, makes a life less boring at times. But sometimes it is serving as a distraction and to avoid other things . I think it is a way to control the way time is passed. You've entertained the possibility that everything I do may not place me in your narrow sociopath category, and you seem to understand that someone with sociopathic tendencies might be able to change their behavior given the right circumstances. This is a jarring departure from your previous assertions. I ask again, are you ill or are you playing with me? I think I said it sometimes, I don't believe that sociopathy is a disorder. So there is nothing such a "narrow sociopath category" besides as a term that clusters some behaviours and people understand. I don't think that you are any less "evil", if you let me use once the politically incorrect term, because you are in the scientific academic environment. What I think is that to have a delusional grandious perception of the self is harder when you are confronted with a reality that humbles you. So you don't earn in niceness you learn in awareness. The niceness, the respect for others, I don't think that can be taught by any circumstance, and that is the key point. Neither ill nor playing you, maybe explaining myself poorly as usual ;). You strange girl. There is not a person in the world who considers me an enemy. Just the other day, I was ragging on someone in a group of friends. I felt that maybe I was a little too harsh, so I messaged him saying as much and added another facebook friend. Being overtly assholeish has never, ever benefited me in the slightest. I respond this way even if I only have the smallest hint that I may have slighted someone. My motives are certainly selfish. I do not want to be seen as callous, or some kind of bully. I treat everyone better than I expect to be treated. My motivations and my core personality are all that exist which could be considered sociopathic. My actions could be considered altruistic if I were not so acutely aware of how they affect my social status. Have you seen people here ask me for my thoughts or advice occasionally? Do I ever answer in a way that seems untruthful, or likely to end poorly for people that speak with me? I genuinely enjoy helping people, I derive pleasure from it. I would even help you if you asked for it. If you came to me for advice on any situation, I would give you my honest opinion. You make me so tired, Jessi. You drain my heart and soul. In every interaction we've had, with every post you've made, nothing of yourself comes through. Are you really that empty, or are you simply keeping yourself from us, so that you reveal nothing that could be used to identify you? Nothing jessi has said on here has ever made sense to me. Ever. Have you seen people here ask me for my thoughts or advice occasionally? Do you always answer in a way that IT IS truthful? "nothing of yourself comes through." I wonder if the anon, "you wrong, you bad" with no argumentation is always the same one, the speech is the same one. Andy writes: " One of the core psychopathic traits is making excuses, not accepting responsibility for one's mistakes." From what I've seen on this board and in her book, there appears to be a related trait, too--a tendency to rationalize (which can often be confused with "being rational.") That is, when things go in a way that some might characterize as "wrong," M.E., Jamie, Emmie, however you want to call her, characterizes it as "what she meant to do." This trait as well can contribute to barriers to learning, because it leads someone with that trait to think there's nothing that "needs" to be learned. I should note that many folks have this tendency, not just the sociopaths described on this blog. That trait just appears to be more extreme with the author here (and perhaps with others characterized as sociopaths?). But I think it helps to write down things beforehand, including intended outcomes and expectations, so that one can compare them with one's after-the-fact perceptions of things, which are subject to such skewing effects. This is a very interesting reflection, the difference between “being rational” and “rationalizing”. Jamie's "what she meant to do" is pretty similar in practice to the emotional "what she felt to do"(let me refer to the more "feeling" group of empaths as the emotionals). I like the distinction you make here- empaths vs emotionals- to help me fully understand- would you say that empaths possess the ability to put themselves in another persons shoes and still retain the power of analytical reasoning, while emotionals are unable to transcend their extreme feeling states? If so- your category of emotionals (reminds me of the "emo" in HS lunchroom hierarchy) strikes me as the less desirable of the two. You know Jessi, it is annoying when you call ME Jamie. Can you show some effing respect to anyone?? @Mach, it was an attempt to find a word for the high-functioning empaths and the low-functioning empaths. I like the adept and the emotional, but you can suggest better terms. I think keeping it simple works best- how about keeping "empath" for those who have both the ability to engage in theory of mind while experiencing some degree of affective understanding of another person's experience and "emo/emotional" for someone who has a lot of feelings but lacks the ability to understand the interpersonal boundaries that locate where their experience and another's experience might be different. Or maybe we can just look to Daniel Goleman's concept of emotional intelligence- he talks about high EQ (empath) and low EQ (emo/emotional) individuals and how the degree of emotional literacy (as opposed to sum total of feelings energy) is the determining factor in whether a person's emotions are a net positive or net negative in their ability to successfully negotiate the demands of living in their particular social construct. The word -empath- it is used here for all non-socio, I don't think it is going to be understood as a high EQ. it means they can very easily slip into aother's shoes and relate especially if they learn a person.this is my understanding. i can learn a person and predict what they will do and even think like they do after spending a bit of time with them.i can interpret their body language to a point i know what they are feeling better than they know. it is distracting. it puts you out of your self. it is not so comfortable if you want to always not offend or overstay your welcome. it makes you paranoid. it is not the same as regular unaware person. By your definition I am an empath, though I am without affective empathy. I think you are an empath if you act like an empath. If your behavior is a product of trying to constructively interact with someone who thinks differently than you, then does it really matter on a practical level whether you "felt" it or if you "chose" it? Being without affective empathy just means it's more difficult to sustain relationships at times, because you must rely on self discipline, not sentiment to act in a loving/constructive fashion. Arguably, your continued efforts to be empathic when you don't have the "push" of sentiment to keep you from acting purely out of self interest makes you a truly noble individual. -"You're very nice, and trust me, you're much better off disliking, or even hating me. If you were in your twenties, I may have selfishly drawn you closer to me. Be glad that you're not, and I didn't." -"One thing that is for sure is that I have a total lack of empathy. " -" I might even feel pleasure hurting you, as it would demonstrate my power and influence." A would personally not apply the "truly noble individual" to Andy. Well, I was speaking hypothetically. Since Andy is not talking about a specific situation it makes sense to address the topic in the abstract. It was never intended to be a final statement about my opinion of his character. In fact, it's wildly inappropriate for me to make a final judgment of any of your characters because all any of us have to go on is everyone's self report of themselves. If judgment is appropriate, an observation of actions and how they relate to spoken words is a key piece of the puzzle. My point was to make sure Andy didn't discount the value of his affective empathy in his efforts to behave in a prosocial fashion. There's an unruly, unstable element in you that leads to self-sabatoge. Does it bore you when things go too smoothly? Do you think in your mind. statement barely get out of your mouth because of muffled laughter? You're like a piece of earth that buckles up from an earth tremor. too; but such a "routine" existence would be like slow suffication. get life. If we have too, we'll get this "life feeling" anyway we can. they wouldn't know higher life if they saw it. Having a periodic need to experience "Doing things the hard way" seems connected to a person's inherent willfulness. The fact that ME cycles back and forth suggests that she is engaged in a sort of man vs. environment struggle that is a common pattern with most personalities who tend to push boundaries by becoming explorers/inventors- the "living on the edge" cliche' perhaps applies here. I don't think this is a bad trait. If everyone has it in a society then things would become chaotic, but the persistence and willingness to allow things to unravel is a central part of what makes innovators move all of us forward. But most men live "lives of quiet desperation..." so it's a net positive for society when a minority has this trait because they are the ones who break us out of our collective slumps. "Life is a daring adventure or nothing at all." I like to see if I can do things that other people won't that take discipline. I like to see if I can do the Yoga breath for 2o minutes or fast for 30 days. I like to see if I can practice really hard things on the guitar or with my voice to see if I can achieve them. This is one of the parts of myself that I really like. Explorers/inventors push the boundaries of the unknown, they don't make more difficult what it has already be done. @Jessi- people are complicated- a mix of positive and negative- my mountain climbing (K2 back in the very beginning), prep school founding, concert pianist, bible translating meglomaniac of a great grandfather changed a lot of lives- both for the positive and negative. He was a dynamic individual whose inability to tolerate boredom was the source of much creative energy and destructive personal behavior. He was an explorer/inventor who did both of the things you describe, and I suspect ME is a similarly driven individual. I don't assimilate activity to creativity. I rather assimilate it to focus and inability to get bored. Perhaps that is where part of the disconnect between our world views lies. I see personality traits, in this case "drive" (or as you put it- activity), having positive and negative outlets for expression. I think that you see traits as either morally good or morally destructive. You see creativity as being a positive thing, and the destructive behavior of misdirected drive as entirely unrelated. Your frustration with those who seek to explore the positive sides of the sociopathic personality makes a lot of sense when I consider this. You believe in moral absolutes and are an idealist. I think I was more of an idealist when I still thought I had more capacity to persuade others to do things my way. There's nothing like parenting teenagers for stripping away that illusion. The way I make peace with the dysfunctional patterns of people I love (and have given up trying to change) is to simply say: "They are wired to need a certain amount of stimulation/activity. When they get bored, that activity is unlikely to manifest as creativity, and will become destructive. So to try to influence my children, I try to anticipate how their personalities will react to a situation and then point them towards a constructive outlet for their individual natures. Your idealism is a good quality if you can channel it into supporting the people in your life, rather than judging them. Perhaps their behavior deserves to be judged. But telling someone they are wrong and you are right is unlikely to change them. I see destruction and creation are like antagonists… wonder why. This sentence horrifies me similarly to some of Andy. The way I make peace is trying to see things as they are and updating the new information. I love people for how they are, so if someone I love has a behavior I detest I stop loving that person. I don’t believe in moral absolutes I believe in the things I perceive as truths as long I do consider they are the truth. I use the word evil when I think it is the word to be used because it does describe the behavior. Point. I try to persuade no one, Mach. I point out what I see. I support the people in my life I consider they deserve being supported and judge the ones I consider they deserve to be judged. To live by ones values is not frustrating at all, to expect others to emulate you is the frustrating thing, but I do believe that people are responsible of their behavior, whether they choose to change or not it is not up to me so it doesn't frustrate me at all if they don't. The way you think is an enigma to me. You have a strong sense of righteousness which is easy to pick up on. Where I struggle to understand you is in how you arrive at your particular conclusions. How do you know that something is evil? What are your criteria? There's an interesting exercise called the Heinz dilemma which is really good for illuminating moral reasoning: if you are game, I'd like to get your opinion on what you think the right answer to the question is and then briefly explain why. The dilemma: Heinz's wife is dying, but she can be cured by a particular drug that the local pharmacist owns. It is way too expensive for Heinz to earn the money to buy the medicine, and the pharmacist refuses to sell the medicine at a discount or accept a promise of repayment. Heinz has two choices- to break in and steal the medicine that night to save his wife's life, or to obey the law and let her die, so he doesn't deprive the pharmacist of his property. Oh Themes, let the poor girl be flattered! I employ evilness as commonly used, to designate acting with bad faith and/or the willingness to harm. I see the moral dilema in the Heinz dilema but, considering the way you depict them, both possible actions are good faith actions, the dilema gets reduced to which is the best. With so few information I would make prevail the life of the woman in front of property, but more information should be given, because maybe the pharmacist needs the medicine to save another ill person. The point of the Heinz dilemma is *more information needs to be given*, therefore there is not a clear answer. Jessi- most situations are like that, but you seem very comfortable with labeling a person evil without considering the larger context of an action. We all do things for complex reasons, and it's never as simple as "Empath=good", "Sociopath=bad"
Your truth is subjective too. It's highly possible that people you have judged and discarded for not meeting your standards of morality (that change) see you as less than virtuous yourself. For me I think in ways that society would consider heinous, if thoughts were crimes I would undoubtedly be in jail. However I have never broken a law and, for the most part, I am unfailingly friendly towards all those around me. By my actions I am a productive, positive member of society who doesn't hesitate to help those who ask for it. By my thoughts I am a potential murderer and a dangerous individual. However it is by my actions that I am judged and as I always keep my mind on long term consequences it is doubtful I will ever get into any sort of legal trouble or lasting social trouble. @Mach, I said "both possible actions are good faith actions, the dilema gets reduced to which is the best." In most situations there are many doubts, but there are also undoubtable evidences. It is important to identify the things we know and the things we don't know and the importance of each. The fact that there is doubt on something doesn't imply that there is reasonable doubt on something else. Evil actions = evil, whether the person is a sociopath or an empath. The truth is not subjective, otherwise is not the truth. And I am not talking about standards of morality, but about people who consciously harm others. @Khan, to only think evil has never harmed anyone besides oneself. You are a doctor and you have a very successful inventor/scientist as a patient dying of heart failure. This person has contributed to helping the human race immensely and would continue to if they were allowed to live. However, there is no one available for an heart transplant so this person is going to die. Then a jobless hobo comes into your hospital, he is perfectly healthy in most regards and is there because he is worried he has something. His heart is perfectly healthy and hes a match for your dying patient. When you ask him if he'd consider a transplant however he refuses because it would kill him. Now would you kill the hobo and take his organs for the scientist or let the scientist die. There is not enough time to wait to see if another donor appears. This is again a moral dilemma where both cases are supported on good faith. what works better on upper lip hair removal? lazor or electrolysis? what is going on when i hit reply and it doesn't open a reply window? That's the automatic drivel filter working. I think that probably my spath thought I was an spath too at the begining because "nothing impressed me much", which was also true for himself. The song is about being clueless and self righteous. Hahaha. Then one of us didn't understand the song.